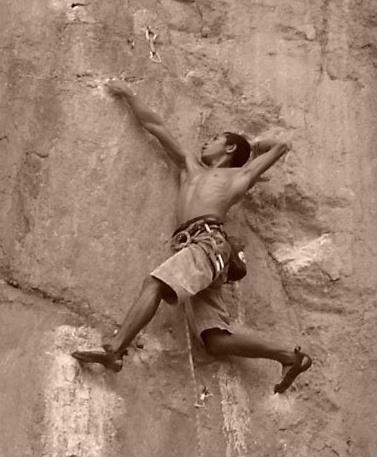 Spreading it while rock climbing. 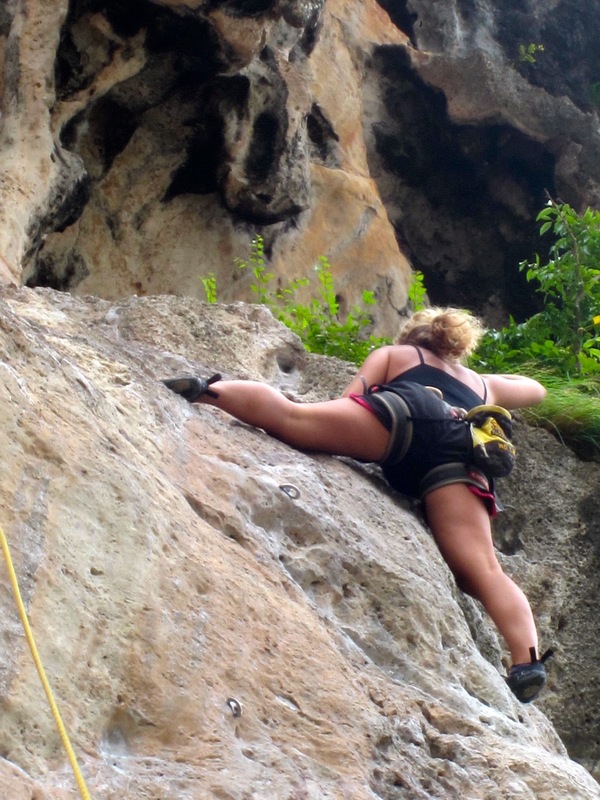 Railay Beach in the south western coast of Thailand is not only one of the most beautiful beaches in the world it’s also one of the top places to go rock climbing. The white sandy beach is encircled by red, brown and green crags who’s vivid colors reflect on the blue-green glassy ocean. Climbers from all over the earth come to Railay beach and its next-door neighbor, Tonsai beach in an attempt to scale the challenging rocks for an amazing view of the Andaman Sea. 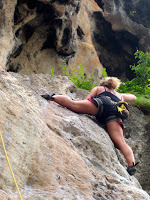 We enlisted in Sea Cliff Climbing Company on Railay beach to give the sport a try for us newbies. 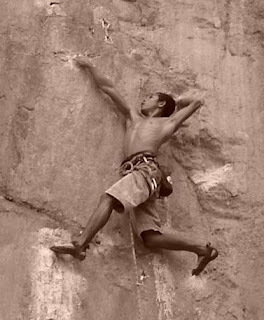 Samsuding, “Samsung” our valiant teacher, who we later found out is a world renowned professional climber, has won competitions in numerous countries. Sammy on a seriously difficult climb. After we geared up, he did a fabulous job teaching all the proper techniques of rope tying, belaying, safety precautions, and gave us ample time and attention to get it right. That way when we climbed we were actually spotting each other and not letting him do all the work. I found myself watching other novice climbers on the rocks who had no idea what they were doing and fighting the urge to give them pointers. I didn’t want to be a jerk store though, so I decided to keep my mouth shut. The three in my group did 3 climbs each, starting with an easy and working our way up to more difficult ascends. Sammy must have had a lot of faith in us because by our second challenge we were doing an intense climb. That or maybe we were actually decent beginners. Each encounter with the rocky peak was like a puzzle you had to put together to reach the summit. Finding tiny spaces to put your fingers and toes and get from one point to another was an exhilarating test, all the while not looking down or letting go. At the end of our first session, I was extremely hot and tired from the suffocating heat and physical exertion but I was hooked! Sammy enjoyed our company as much as we did his, so a day or two later I called him up and he decided to take us out on an unofficial ascent where the real climbers hang. 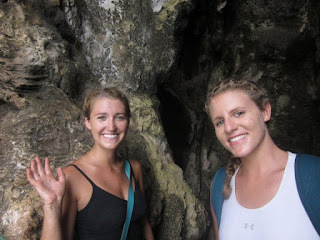 We strolled up to Phangang Beach and headed towards a giant rock with a massive cave you could see from a far distance. The jungle trek to our first climb was the commencement to our adventure for the day. After one difficult climb to begin the grueling day, Sammy led us through the cave with his flashlight and my tiny light. Beginning the trek through the cave. We hauled all of our gear and ropes through the dark climbing over rocks and up rickety bamboo ladders that had been in place for what looked like a hundred years. The pitch-black trudge took about a half hour and by the time we reached the opening on the opposite end of the cave, our breaths were literally taken away from the most astonishing view I have ever seen in any picture or real life. The photos I have certainly do not do it justice. The opening to the cave displayed an aerial view of Railay and Tonsai beach with the colorful long tail boats and kayakers like tiny pieces of confetti sprinkled below us on the water surrounded by the tall brown and green peaks. Each person repelled from the cave to the red rocky ground below and continued a last climb of the day. View of Tonsai (left) and Railay beaches from the cave above. 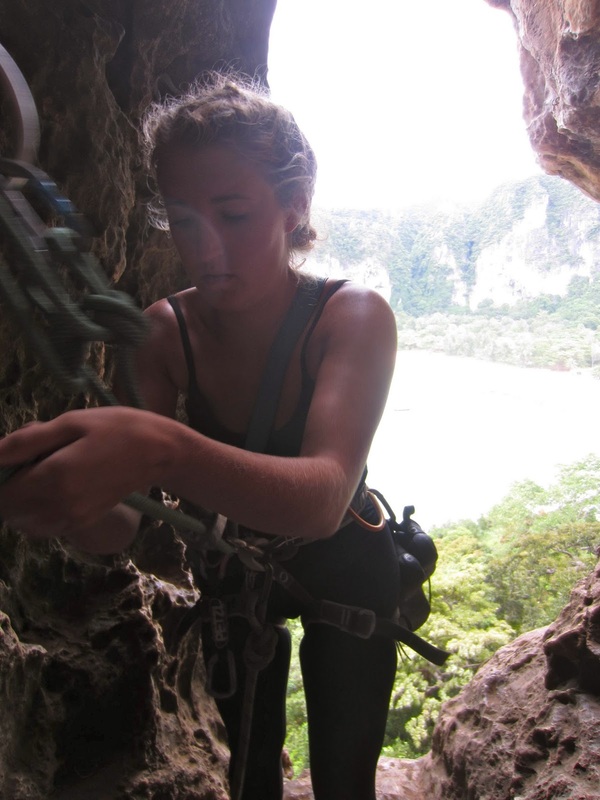 Gearing up to repel down the cave. Taking time to enjoy the scenery from inside the cave. 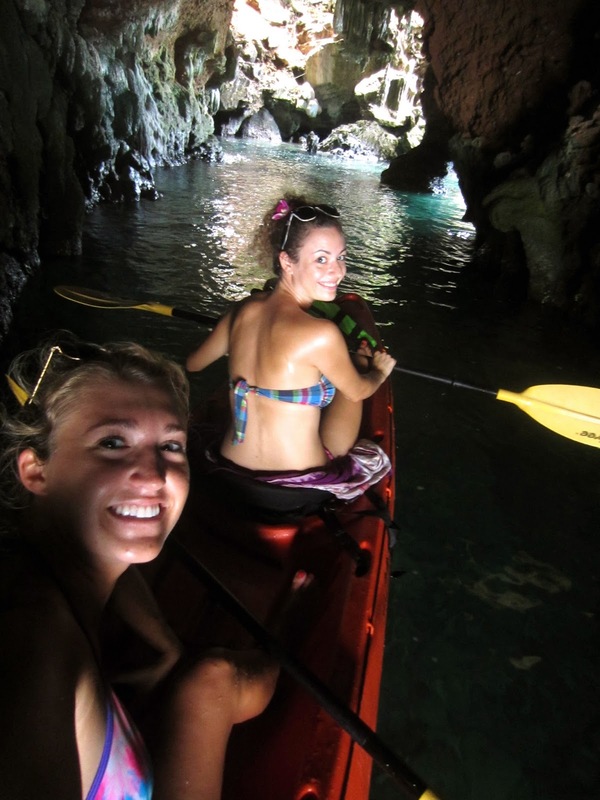 If rock climbing doesn’t strike your fancy, kayaks are fun to explore the beaches and caves that encompass the area. Michele and I rented kayaks and set out just as a torrential downpour began out of nowhere like usual during monsoon season, so we entered a big grotto to wait out the storm. I began to scale the rocks in the cave for my entertainment and nearly sliced my hands and legs open because it was so slippery. Not recommended. The water inside the cave looked as if it’s glowing and made me feel like I was in a dream or and unreal place. Once the rain ceased, we paddled for hours around rocks and inside caves to check out tons of crabs, fish, and tiny grottos. After a few hours of rowing, you can park your kayak at Phanang Beach where long tail boats cook and serve food right from their boat. Kayakers can rent boats for an inexpensive fee per hour or for a half or full day at a discount. There is a ton to do on Railay, it’s a non-stop place to get in all your sporting activities plus a great beach to recover those strained muscles. Michele and I kayaking through a small cave off Railay beach. Boats on Phanang beach that serve lunch right on the shore.